Discussion in 'Muppet Headlines' started by Phillip, Nov 3, 2015. 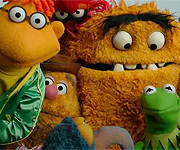 What did you think of "The Muppets" episode "The Ex-Factor"? 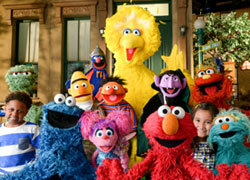 Tonight make plans to watch "The Muppets" new episode "The Ex-Factor" at 8|7c on ABC. Then join the discussion immediately afterwards in the Muppet Central Forum. If you saw "The Ex-Factor" please like this post and share your thoughts below. MikaelaMuppet, dwayne1115 and Muppy like this. Unfortunately missed out because my ABC affiliate, which was working fine a few minutes before decided to black out when it came time for the show I was waiting practically three hours for. And this was an epixode I was looking forward too because it features Denise's return. Will have to read through most of the posts and toughpigs' review, but it's better when I get to actually watch the episode itself. I was more interested in the b story featuring the Electric Mayhem and Kristen Chenoweth than the a story with Kermit, Denise, and Piggy. In my opinion, the Kermit/Piggy storyline needs to take a break and let other characters get more screen time. I was laughing during the bus trip with Janice explaining to Floyd how she's not involved with him but then Dr. Teeth pointed out at one point He and Janice were an item. I also liked the gag with Zoot and the echo is was creating. And hey, Lips had more lines. He's said more in the last month than he has said in the last 35 years. oknazevad, LaniArianna and Mo Frackle like this. So they are actually bringing up the Floyd and Janice relationship?!?! That makes me happy. Wonder how that would play out with Sam the Eagle in the future. Okay so... kermit making a plate about his first date wiht denise was cute and I think she would have loved it. WHAT DID THEY DO TO THEM?! Yea cause if Janice is really single then that just might change things. I thought this episode was hillarious.I loved the Eletric Mayhem plot but both plots played out wonderfully, but I especially liked that there were only two plots instead of three,it really helped the pacing. Glad Fozzie didn't get a storyline,I like him but he has gotten a plot in all the other episodes so i'm happy they changed it up a bit. Liked the whole Kermit/Piggy relationship a lot more today and it may kill me to admit this but I actually don't hate Denise. All in all this is my favorite episode so far! Duke Remington and Muppy like this. Wait, you haven't seen the show yet????!!! No I am living in a different church every week and have to wait till Wednesday and pay 1.99$ per show. number 2: janice is more new age weird than she EVER was. also she NEVER used to have have a problem with floyd saying she was "his woman" she actually seemed very happy about it. number 3: dr. teeth does not seem like the kind of person who would go behind floyd's back and cheat on janice and he doesn't seem to be the type to even date her. number 4: they all act like a bunch of jackasses! since when has the band been so horrid to one another like that? Granted I haven't seen the episode yet, I think it's time to throw away all comparisons to the past. These creators clearly don't care about or respect the past of these characters. If they cannot how a character is established and it's not a reboot (which it isn't) they have no business using them. I know that sounds harsh but I don't like character derailment. It would be like taking someone like... freddy kruegar and making him a friend to all living things. Pretty enjoyable episode. I wonder if the staff was paying attention to the complaints people had about previous episodes. Notice that we only had an A and B story this time around. Definitely enjoyed the main Kermit-Piggy plot. Still warming up to Denise, though. The EM subplot had some fun moments in it, particularly with Animal ("you guys get paid??!!"). I definitely think the writers were playing with the JaniceXInsertbandmembernamehere fans by bringing in the whole "not attached to anyone" concept. Personally, I thought it was funny. And hey, the band actually got a subplot! Oh, and Lips got another line or two. Didn't care much for the gang leaving Chenoweth behind, though. Scooter was probably the biggest highlight of this episode! FletchySRF3088 and Duke Remington like this. Yeah. I was wondering what the deal was with and on this series. Sort of a nice call back to the early episodes of TMS. I recall Janice would dance with Zoot in the At the Dance segments, but I believe she did dance with at one point as well. Piggy's ending line was great too. "Kermit's my friend and I would do anything for him. But you never ask your ex what to get your girlfriend for her birthday. I think he knows that now." You live in a church? 'Splain, Lucy. Lol. Just a bit curious there. I agree. Scooter throwing out that idea sort of got in the way. I think Kermit is still in the habit of listening to whatever Scooter says because of his uncle's ownership of the Muppet Theater back in the day. Fer sure. I would like to see them do more with the plot about Sam's crush on Janice and what Floyd's reaction would be. Hopefully they'll do something to that effect. Liked the episode. The bits with Scooter in the pottery shop were great; I love the development of his character into, and I'm using this word in an affectionate form, a loser. He's a nerd and someone who is clearly not afraid to show it, like pointing out all the problems with Kermit's plate. I also liked seeing Denise actually have her character explored, getting to know her a bit more. Her puppet seemed a lot better in action and the glasses help make her look more "Muppet"-ish if that makes sense. Hopefully we'll see more involvement from her if the Kermit/Piggy/Denise storylines are to have any real impact, following today's developments. It was good to see a warmer side of Piggy combined with, but not overwhelmed by, her pettier side. The EM plot was okay, had some good lines and seeing Animal pour Funyions on Kristin Chenowith was a good gag. I didn't find anything out of character there, Zoot just seemed spacey as usual to me and for all we know, Dr Teeth and Janice could have known each other before Floyd. All in all, a strongly plotted episode and an improvement over last week. Duke Remington and Mo Frackle like this. But yeah I think saying that they dont care and dont respect the characters past is going too far. Yeah this show definitely has some kinks to work out when it comes characterization (Scooter's attachment to his mother can go), but its more of the "finding the groove" the most shows go through during their first season, but not outright not caring. I didn't think Zoot was acting high, just slow on the uptake. And its great to hear him and Lips talking. Uncle Deadly Pepe Yolanda Gonzo Chip Statler and Waldorf all get some good lines. Denise is back and shows a pretty likable personality. Duke Remington, Drtooth, Muppy and 2 others like this. I see what you're saying, but they just had a disagreement. They're friends. They fight sometimes. Muppet Master, Duke Remington, Drtooth and 2 others like this.